[num,den] = iirlpnormc(n,d,f,edges,a) returns a filter having numerator order n and denominator order d which is the best approximation to the desired frequency response described by f and a in the least-pth sense. The vector edges specifies the band-edge frequencies for multi-band designs. A constrained Newton-type algorithm is employed. n and d should be chosen so that the zeros and poles are used effectively. See the Hints section. Always check the resulting filter using fvtool. designs a lowpass filter with a peak of 1.6 within the passband. [num,den] = iirlpnormc(n,d,f,edges,a,w,radius) returns a filter having a maximum pole radius of radius where 0<radius<1. radius defaults to 0.999999. Filters that have a reduced pole radius may retain better transfer function accuracy after you quantize them. [num,den] = iirlpnormc(n,d,f,edges,a,w,radius,p) where p is a two-element vector [pmin pmax] allows for the specification of the minimum and maximum values of p used in the least-pth algorithm. Default is [2 128] which essentially yields the L-infinity, or Chebyshev, norm. pmin and pmax should be even. If p is 'inspect', no optimization will occur. This can be used to inspect the initial pole/zero placement. [num,den] = iirlpnormc(n,d,f,edges,a,w,radius,p,dens) specifies the grid density dens used in the optimization. The number of grid points is (dens*(n+d+1)). The default is 20. dens can be specified as a single-element cell array. The grid is not equally spaced. [num,den] = iirlpnormc(n,d,f,edges,a,w,radius,p,dens,initnum,initden) allows for the specification of the initial estimate of the filter numerator and denominator coefficients in vectors initnum and initden. This may be useful for difficult optimization problems. The pole-zero editor in Signal Processing Toolbox™ software can be used for generating initnum and initden. [num,den,err] = iirlpnormc(...) returns the least-Pth approximation error err. [num,den,err,sos,g] = iirlpnormc(...) returns the second-order section representation in the matrix SOS and gain G. For numerical reasons you may find SOS and G beneficial in some cases. Check the radii and location of the resulting poles and zeros. If the zeros are all on the unit circle and the poles are well inside of the unit circle, try increasing the order of the numerator or reducing the error weighting in the stopband. Similarly, if several poles have a large radius and the zeros are well inside of the unit circle, try increasing the order of the denominator or reducing the error weight in the passband. If you reduce the pole radius, you might need to increase the order of the denominator. Poorly conditioned matrix. See the "help" file. The approximation error is extremely small (try reducing the number of poles or zeros — refer to the hints above). The filter specifications have huge variation, such as a=[1 1e9 0 0]. This example returns a lowpass filter whose pole radius is constrained to 0.8. 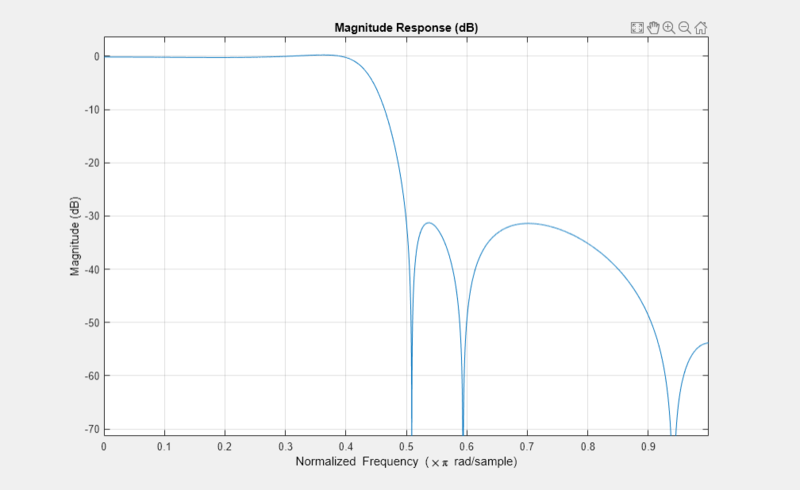 The magnitude response shows the lowpass nature of the filter. 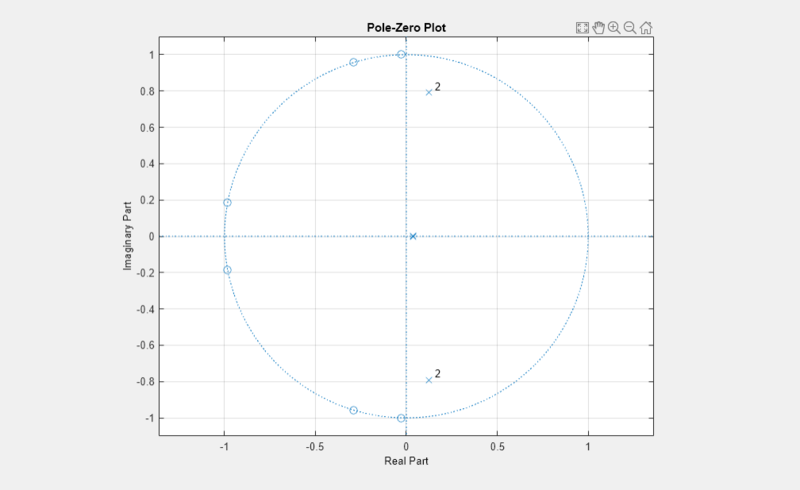 The pole/zero plot following shows that the poles are constrained to 0.8 as specified in the command.